Occasionally HMRC may issue an instruction for you to change the tax code in use for one of your employees. This guide shows you how to do this. Click ‘Pay – Pay Details’ or click the button to go to the Pay Details screen. Click on the ‘Basic’ tab on the Pay Details screen. Go to the period that the tax code needs to be changed (normally the next pay period), and double-click on the tax code. 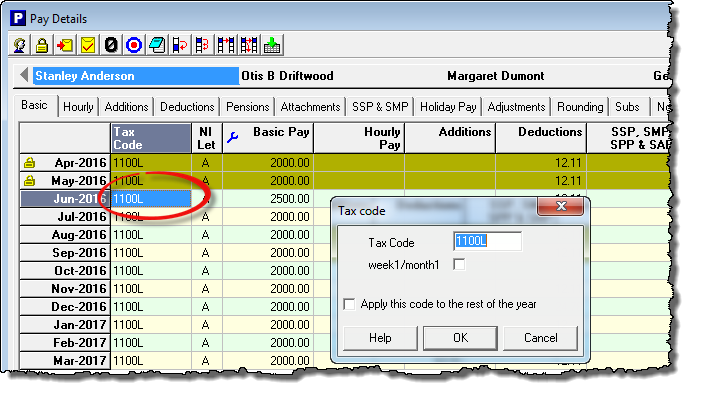 Enter the new tax code, tick the box marked ‘Apply this code to the rest of the year’ and click ‘OK’. And that’s it. The tax calculation for this employee will use the new tax code from this period onwards. Sometimes the HMRC notice will also ask that you record previous employment pay and tax figures when changing an employees tax code. These figures can be entered on the ‘Adjustments‘ section of the Pay Details screen. Go to the ‘Pay Details‘ screen and click on the ‘Adjustments‘ tab. Enter the ‘Previous employment pay’ and ‘Previous employment tax’ figures as appropriate in the same pay period that you changed the tax code.